More about Marimekko Weather Diary White/Black/Yellow Salad Platter Delicate watercolors lend an artistic and chic look to the Marimekko Sääpäiväkirja White/Black/Yellow Salad Platter. 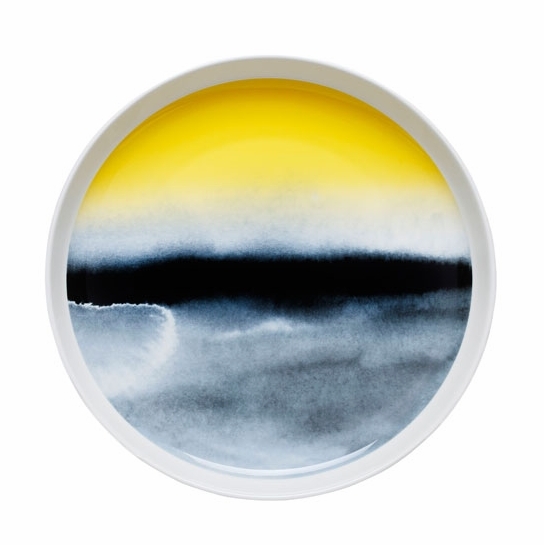 Varying shades of black and yellow on this porcelain platter portray a foggy morning on the Finnish archipelago. On its own or intermixed with other pieces from the Weather Diary collection, this piece will make an exceptional addition to your home. This plate ranks #1. In my serving plates collection. Both functional and aesthetic. I purchased one a few years ago, bought another one this year to make it a pair. Comments from your guests. Display it prior to serving your entree so that guests or family can enjoy the colours, shape, size and capabilities of this piece of ceramic.....in or out of oven or freezer.....it is a piece you will choose to forward on some day.....brilliant in design and practicality. So pleased I found it! The plate looks really gorgeous when serving salad or baked goods. It's nice that you can use it in the oven. It even works as a shallow pie dish. chose this item to brighten my kitchen this spring; bring me into the summer season. 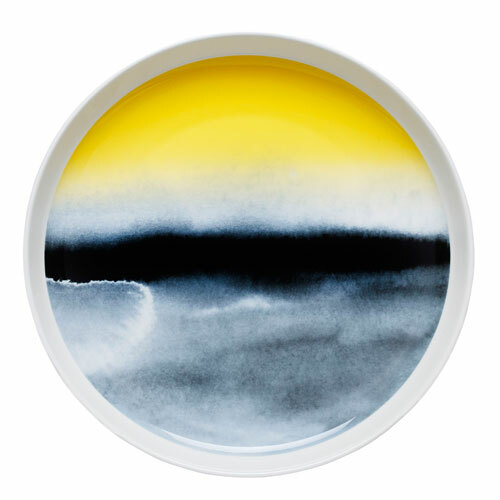 the weather diary dinnerware is mysterious and beautiful, unusual. A very beautiful plate and a wonderful size and shape. ConsThe beauty is hidden when food is on it. Do you know if this piece is fired at a high temperature? In other words, will it chip easily?? I am unaware of what temperature it is fired at, however it is very durable as it is dishwasher, microwave, oven and freezer safe.